So with Highway hitting the screens recently, there has been a lot of buzz in B-Town not only because Aalia Bhatt has done a fantastic job but also because the movie promises a different world of ‘music’ altogether. But why is that? Ofcourse it is because none other than the Maestro has lent his tunes to the movie. What is creating wave in the music scene now? Ofcourse it is the album ‘Raunaq’. Well one reason is that it is Kapil Sibal’s second attempt at writing after his contribution for Bandbook. 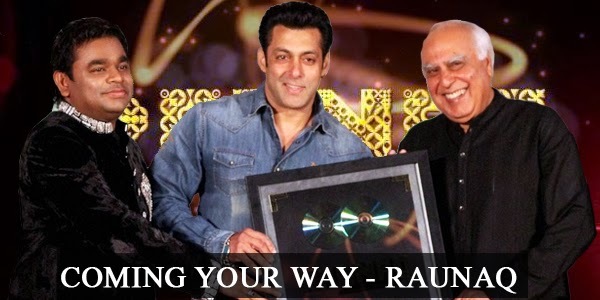 The album which was unveiled by Salman Khan during the launch carries about 7 songs in total. Singers like lata Mangeshkar and Shreya Ghoshal are a part of this album too. Jonita Gandhi is also another person that one could see in this album.The hopes are high considering this music album has the best of all. Moreover, one specific song in the album featuring Yami Gautham has the visuals inspired by Ravi Varma paintings. A.R.Rahman is always known for the difference he brings out through his works, the detailing in each of it. We hear that ‘raunaq’ has something for all the music lovers.Backed by Sony music for the musical production, this album has a lot to offer. For now all we can do is immerse ourselves in this beautiful number – ‘Kismat se’.